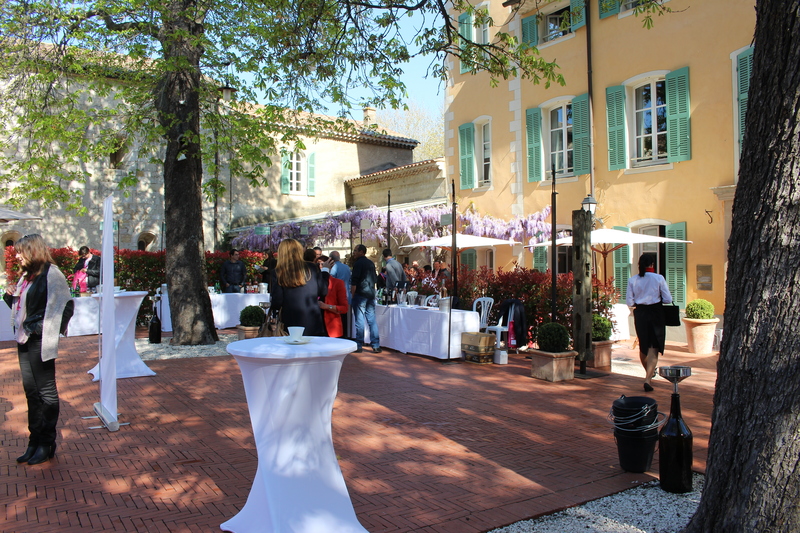 At the annual Coteaux Varois tasting (13 April 2015), set in the beautiful gardens of a former monastery, at Alain Ducasse’s restaurant at the Abbaye de la Celle in Brignoles, and next door to the Maison des Vins de Coteaux Varois, 45 local domaines had their stands set out showing their wines. 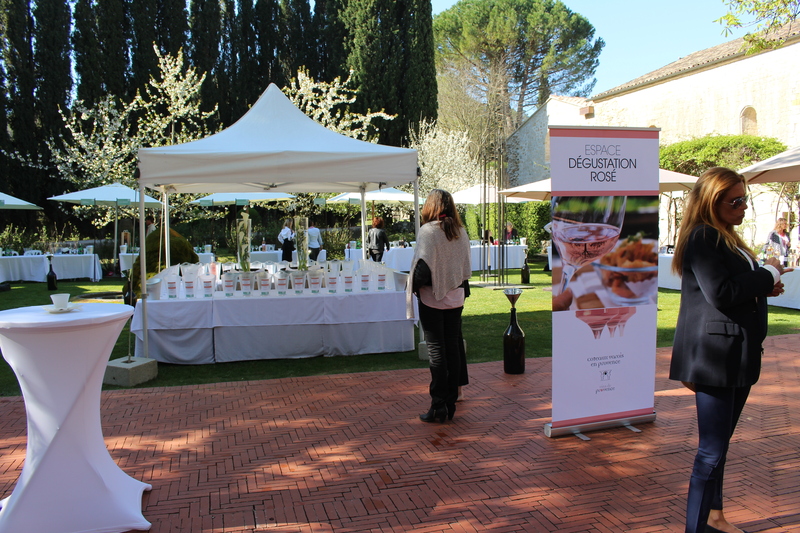 The 2014 rosés were presented at a central table, showing the importance of rosé wine to the Coteaux Varois-en-Provence (to give the appellation its official title). 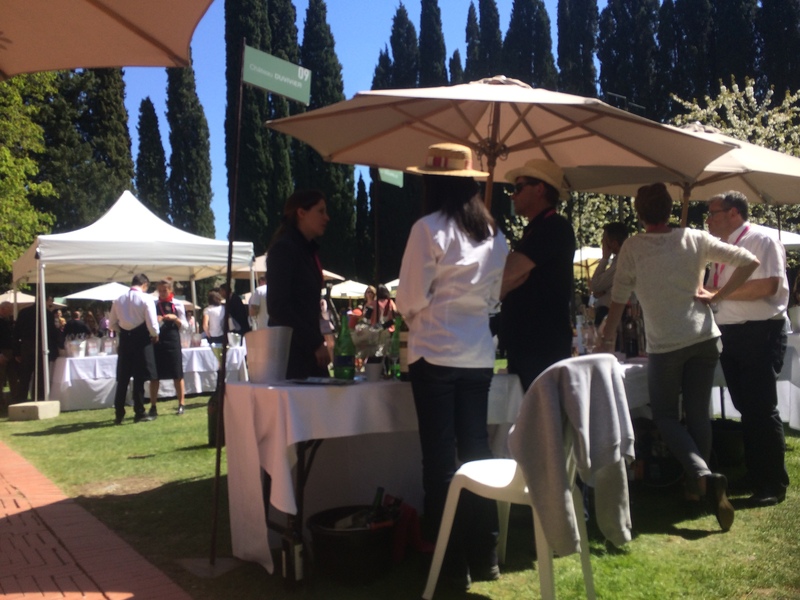 This is one of the most beautiful, and enjoyable tastings that I attend during the year – Coteaux Varois excel in presenting their wines in style, often with a coloured theme. In past years there has been a floral colour theme of pink, purple and green used in the ice bags and for their 20th anniversary it was white, silver grey and golden yellow. This year it was all white and looked very pretty in the bright sunshine with fresh late spring greenery. This very elegant style gives a garden party atmosphere, further emphasised by the delicious canapés from the Ducasse restaurant. This year a more substantial lunch was also served on the terrace, away from the tasting area which prevented too big a distraction. 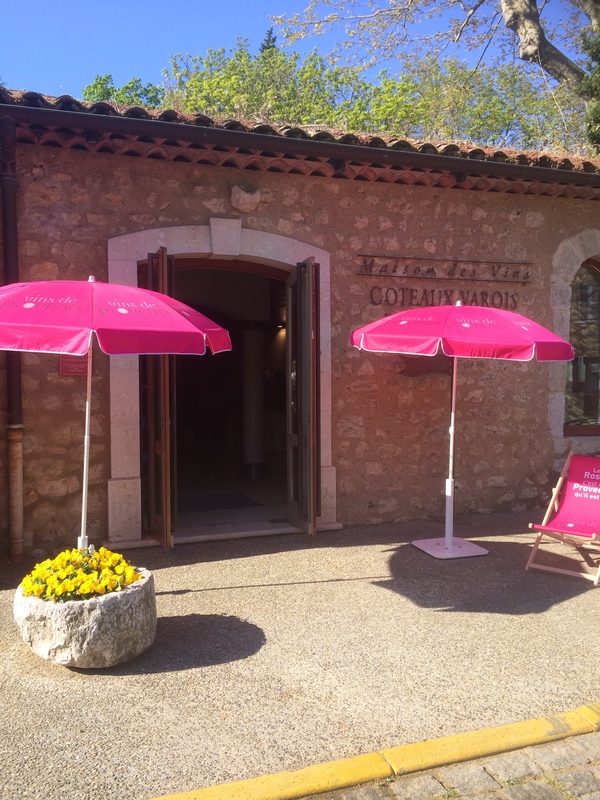 Most importantly of all, despite the fact that Coteaux Varois often appears to be in the shadow of the larger Cotes de Provence, it includes a very good range of wines and some interesting surprises. I tasted 53 rosé wines, from 45 domaines (in some cases several rosés from one estate). As the appellation includes 75 private domains and 10 cooperatives, this tasting included around half of all Coteaux Varois rosés. The area covered by the appellation Coteaux Varois is 2500ha, with production made up of 90% rosé, 7% red and 3% white. The soil is largely chalky; rocks run in east-west bands with alternating flinty gravel. The region is surrounded by the lower slopes of the Massif de Ste Baume in the south west, the Bessillons Mountain to the north, and the Barres de Cuers in the south, sheltering the region and tempering the Mediterranean heat. Coteaux Varois vineyards are located at relatively high altitudes, averaging around 350m, with the highest at 500m. Relatively high altitudes and a mixture of soils (the chalk, in theory, giving fresher acidity, and the flint greater minerality) suggest fresh wines. So, when reviewing the range of rosés tasted, I was a little surprised that – far from having the crisp acidity noted in the 2014 Côtes de Provence tasting – the overwhelming character of these Coteaux Varois rosés was a charming creamy nutty character in all the different styles, whether a predominantly crisp red fruit rosés or a more mineral style. Is this from the wine-making or is it a character of the appellation? There seemed to be little connection with style and location within the appellation. Grenache, Cinsault and Syrah were the most frequently used varieties. Of the wines tasted, all but two wines included Grenache (51 wines), Cinsault (41 wines), Syrah (wines 36), Rolle (9 wines), Mourvedre (6 wines, 5 times with Syrah), Cabernet Sauvignon (2 wines, not with Mourvedre or Syrah) and Carignan (1 wine). The wines listed below are wines I liked, but are listed in no particular order of preference and price was not taken into account. Quality ranges from fresh and simple to higher quality. Creamy peachy fruit with a more mineral flinty structure. The first and last groups are the biggest. Bergerie d’Aquino Etoiles d’Aquino; Cellier de la Ste Baume Royale; Domaine l’Escarelle Prestige; Domaine l’Escarelle Mes Bastides; Domaine de Valcolombe Grande Cuvée (black label); Château du Fontlade St Quinis ; Domaine du Loou Rosée de Printemps; Château d’Ollières Classique; Domaine les Vallons de Fontfresque Tamaris; Domaine de la Gayolle Anne Flore; Domaine St Jean de Villecroze Cuvée Speciale; Domaine St Andrieu l’Oratoire; Domaine St Mitre Clos Madon. Domaine Valcolombe White Label; Bastide de Blacailloux Eclosion; Domaine du Deffends Rosé d’une Nuit; Domaine la Julienne Emilie; Château Margui Perles de Margui; Château d’Ollières Prestige; Domaine de la Ramatuelle Bienfait de Dieu; Château la Lieu Batilde Philomène. Château la Calisse Patricia Ortelli; Domaine l’Escarelle 1718; Château Lafoux Château. Comptoir des Vins de Flassans Rêves de Comptoir; Cave la Roquière Laoutien. 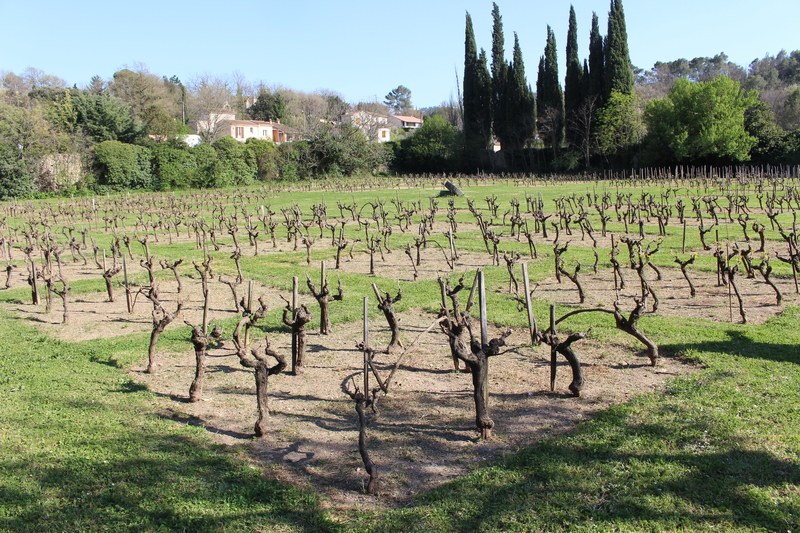 Domaine les Terres Promises Apostrophe; Domaine des Annibals Suivez-moi-jeune-homme; Château Fontainbleur du Var Louis Baptiste; Estandon Vignerons Lumière; Domaine la Goujonne Reine Marie; Domaine de la Grand’Vigne Les Fourneys; Chateau Margillière Hautes Terres; Domaine Mira Luna; Bastide des Oliviers Justine; Château d’Ollières Haut de l’Autin; Domaine de la Prégentière Prestige; Domaine la Rose des Vents Seigneur de Broussan; Vignerons de la Ste Baume Restanques Bleues.